I LOVE when people move! Fresh start! I get to design, set up and organize home offices, living rooms, bedrooms, kitchens. I always have so many IDEAS. The first thing that needs to be put together is the kitchen. Of course you have to eat! and drink coffee and tea in the morning. I put together a series of photos of what I call a “drink zone” from the last home I lived in. 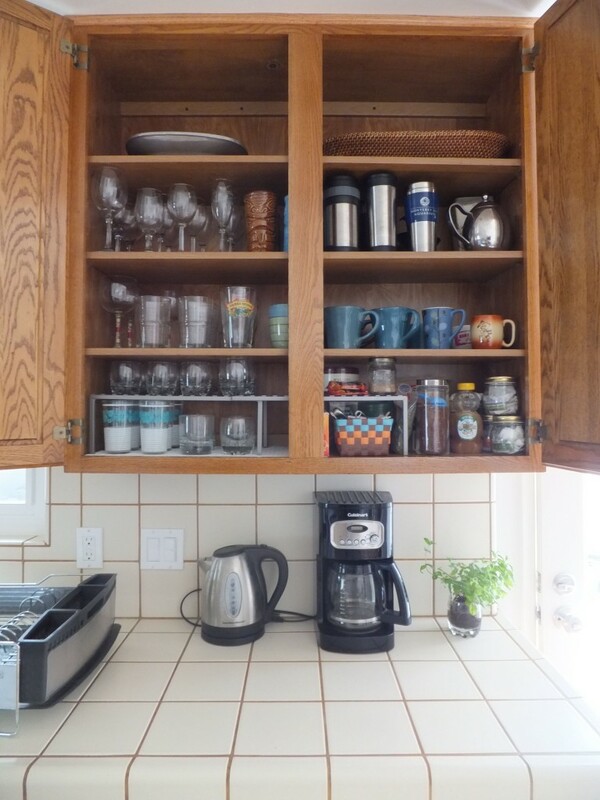 I work with clients on kitchen organizing regularly, so these photos give examples of what I’m always talking about with them. An organized drink zone is a place to store everything you need to make your favorite “for here” and “to go” drinks: coffee, tea, and their implements, cocoa, various drink mixes (such as emergen-c), sugars, honey, mugs, travel mugs, glasses, coffee and tea maker, blender, juicer, etc. Keep in the upper shelves things such as platters and baskets that you will use for serving drinks or drink-related tools and accessories. 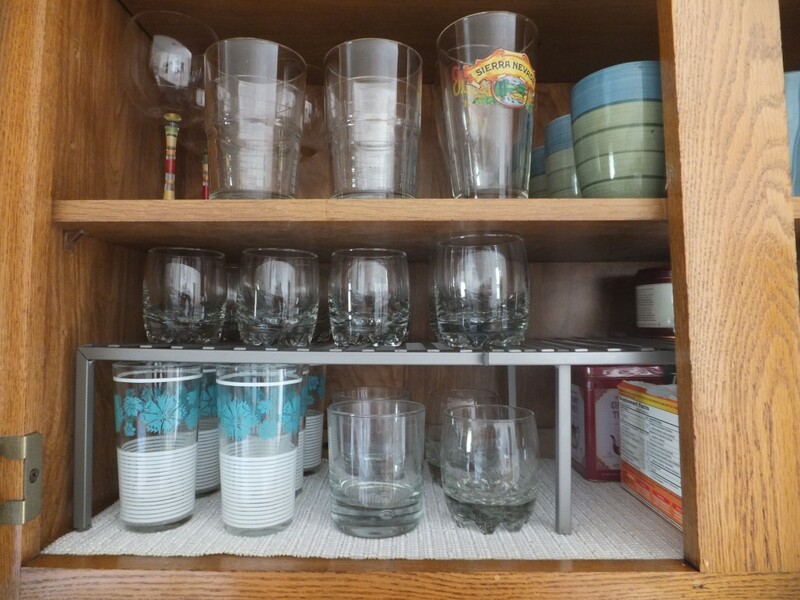 Everyday drink glasses should be placed on the lowest, most reachable shelf, and less commonly used glasses up higher. Here I used a chrome expandable shelf extender purchased from a local home store. The cabinet shelves are adjustable, so I adjusted the area to have enough space to add the extender so that the glasses stack and a hand can comfortably grab and put things away. Lining kitchen cabinets is sometimes necessary. I like to line the lower, most commonly used dish cabinets. Why? 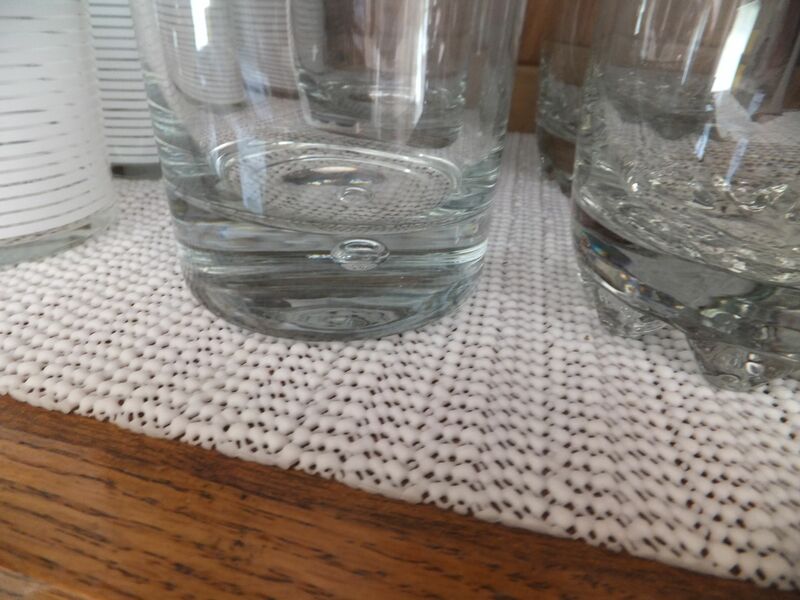 Because it protects glasses from sliding around, from clanking and chipping on the cabinet, and it protects the cabinet from water damage if you put away the glass without completely wiping it dry. If you rent or are detailed about the resale value of your home, take care of the cabinets. My favorite is this spongy no-slip liner because it’s easy to measure, cut, and place, unlike sticky liner or the hard plastic kind that rolls and bends at the edges. The brighter the liner color, the brighter it makes the inside of the cabinet, the easier it is to see what’s inside…works especially well in dark spaces. Shelf liner protects the surface and your drink glasses. We move up to the less-commonly used items…the wine and “special occasion” cocktail glasses. Alway have a small step-stool nearby for when it’s time to bring these babies down and par-tay. 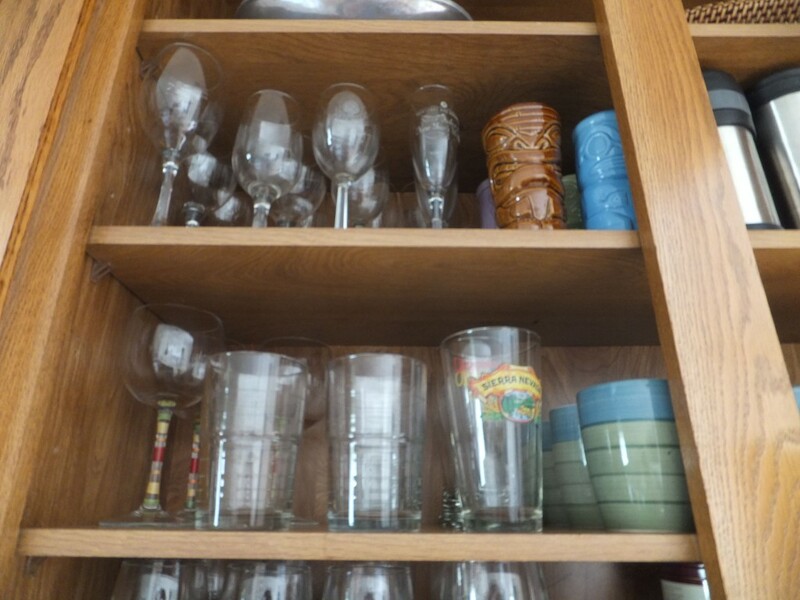 Less commonly used glasses go higher up in the cabinet. 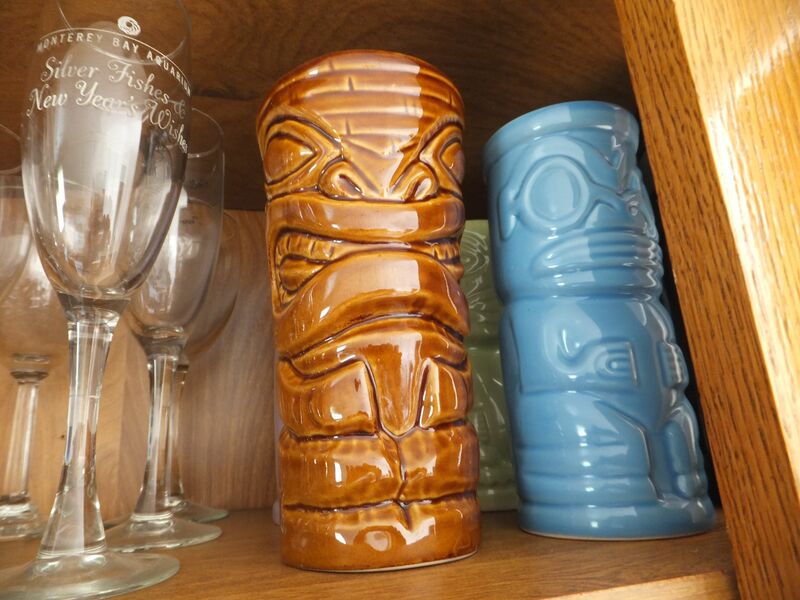 Everyone loves tiki cocktail glasses! 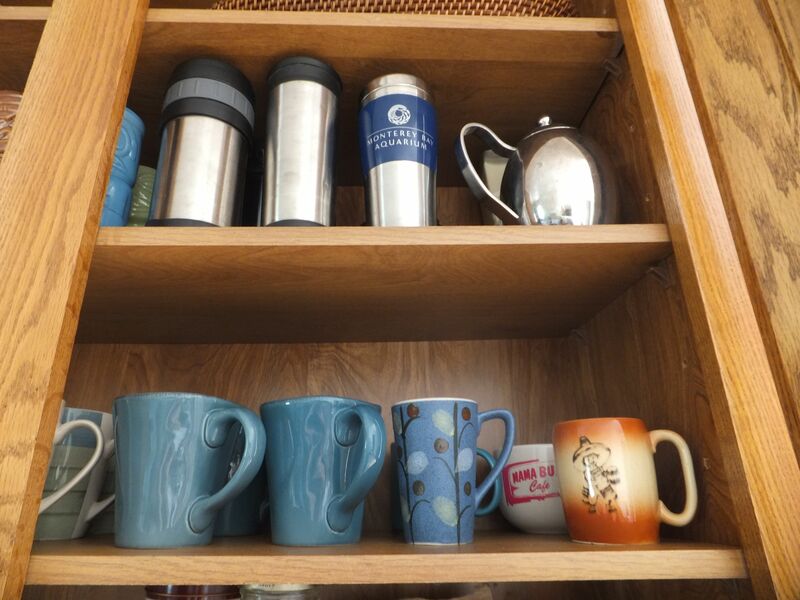 We move over to the upper right where the coffee and travel mugs live. Six travel mugs is probably more than enough for two people. 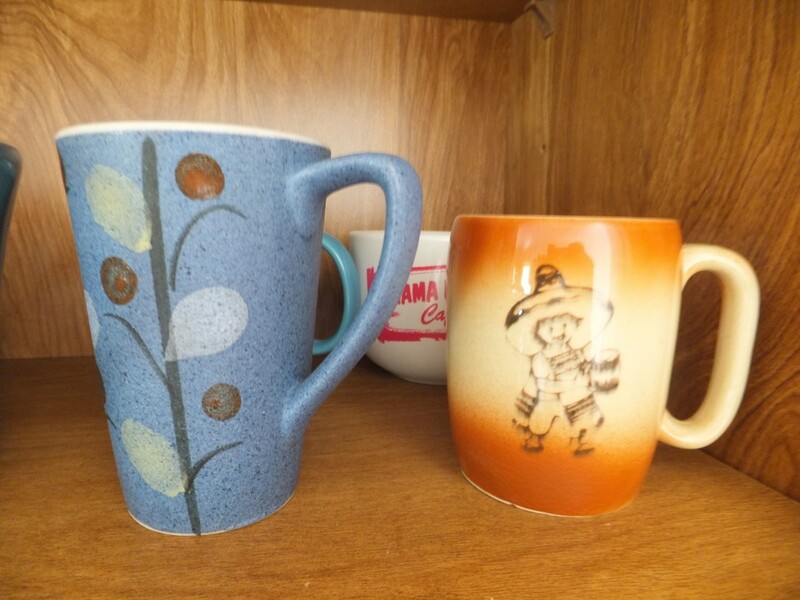 Many moons ago I had a thrift store collection of cute mugs, but have since pared down to three: the skinny blue one with flowers that I love for hot chocolate, my little sombrero man, and my mama buzz mug. Mama Buzz was a hip local coffee and sandwich shop on Telegraph Avenue in the Temescal area of Oakland that also sold beer on tap, and showcased local art & music. It’s since changed hands and is now a beer garden with tasty sausage dogs. The new beer garden is a bustling social hub during the First Fridays Art Murmur…but Mama Buzz will forever live in my heart and kitchen cabinet. My favorite mugs are simple treasures. 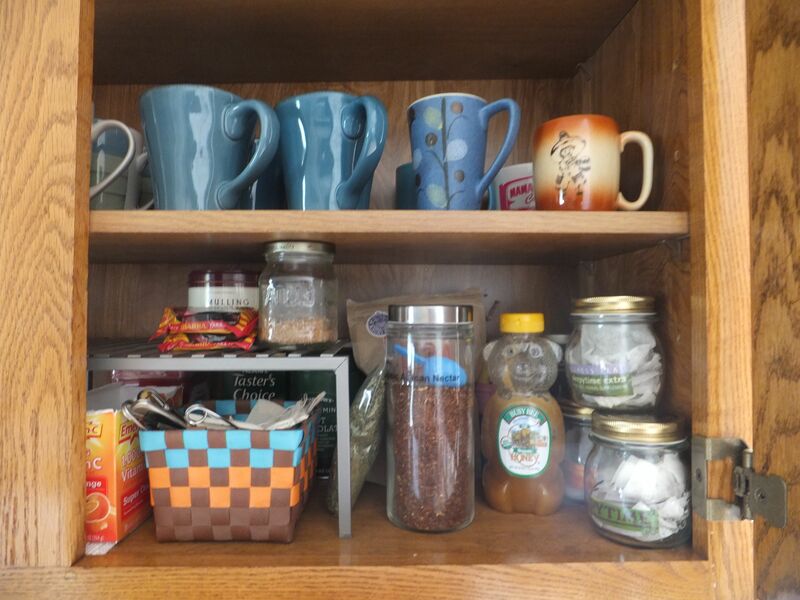 The lower-right side of the cabinet is where the coffee, teas, honey, sugar, mexican hot chocolate, mulling spices, emergen-c, coffee filters and drink implements live. Coffee and tea drink zone. 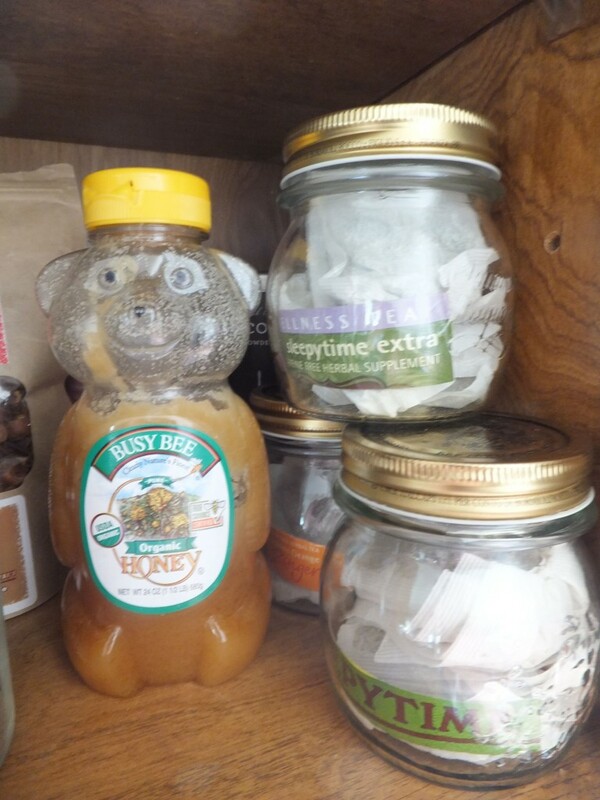 I like to store loose tea bags in small, stack-able mason jars…they keep fresh longer. I simply cut the cardboard label off and place it in the jar so we can see and read what it is, and know when it’s time to buy more. Store loose tea bags in mason jars to keep them fresh longer. 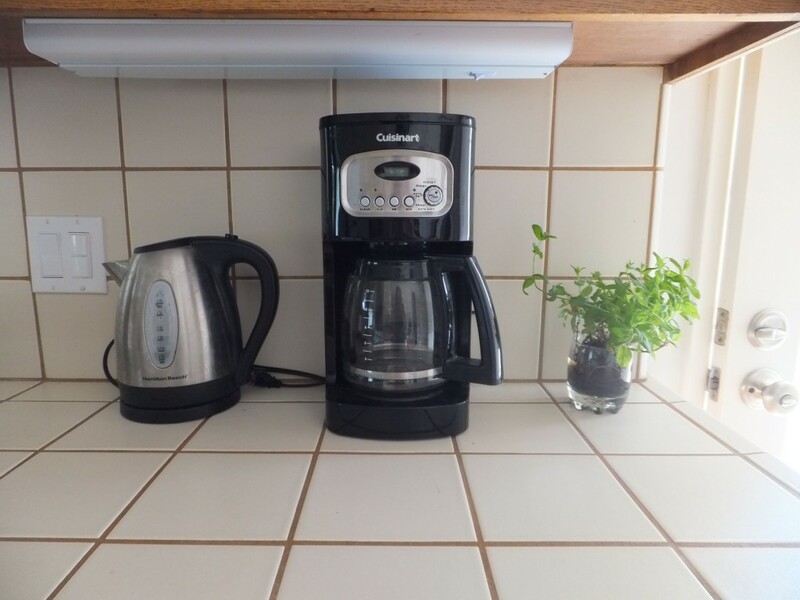 The counter top below is specifically for drink-related machines and gadgets: the electric water kettle and coffee maker. The large cabinet below the counter houses the juicer and blender which are too bulky and heavy to keep on the counter but used often enough to store nearby. 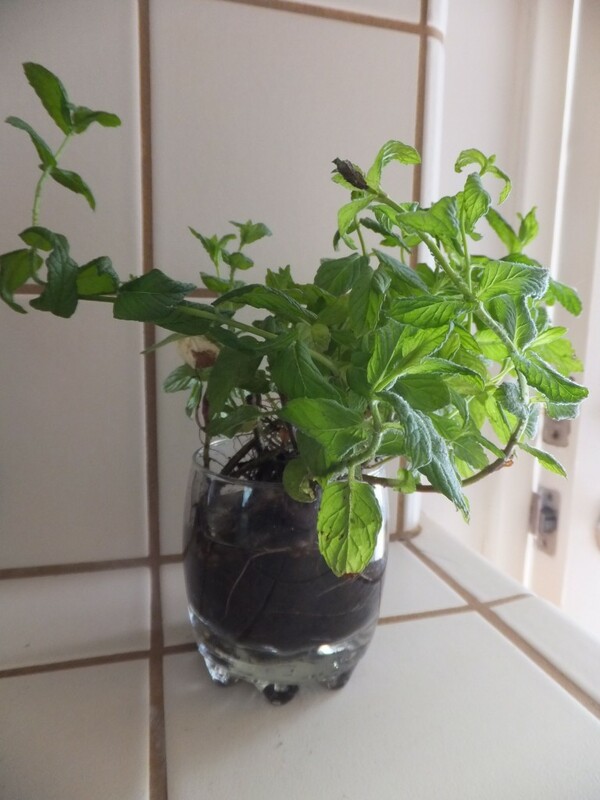 I keep mint with it’s roots in a glass of water by the sunlight to pick when I’m craving fresh tea. Mint is invasive in the garden, so pulling a little out at a time by the roots will keep them thinned. There’s no better tea than fresh mint tea. Fresh mint ready for picking. This is our kitchen drink zone. We add to it only when things break or run out, so that it doesn’t get cluttered. We keep in it things we love, cherish, and use regularly…things that make us happy when we open the cabinet and see them. Ready for more? Call (510) 229-7321 today to schedule a complimentary estimate for your kitchen and pantry organizing goals. Gift certificates are available.